88 Bar began life as a blog for one of the Institute for the Future’s research programs. This was back in 2006, and our blog was called Virtual China. With it, Lyn and I set out to document our “exploration of virtual experiences and environments in and about China.” Many of our posts had an excited “look what I found” feeling, a reflection of the mid-2000’s optimistic rhetoric around the Chinese internet and general paucity of China tech blogs at the time. 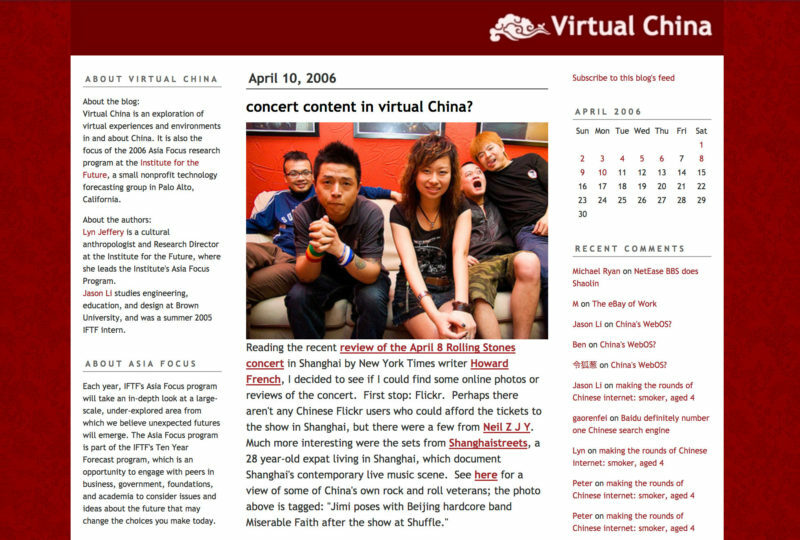 Virtual China was publishing from 2006 to 2008. Back then, in the US, “Web 2.0” was still a prominent meme, blogs were in their heyday, and Second Life was seen as the future of cyberspace. In China, blogs were a fast-growing phenomenon, but it was the forums, or “BBS’s” as we used to call them, that were really buzzing with activity. More importantly, many felt that the Great Firewall would crumble any day now, mysteriously and suddenly like the Berlin Wall. By a stroke of luck, we got hold of the old Virtual China archives from the Institute of the Future a few months ago. Since then, we’ve been hard at work porting the content – sanitizing and restoring what we could – over from Typepad, from Archive.org. (The original Virtual China blog and URL are sadly now defunct.) Today, we’re proud to announce that, for 88 Bar’s ninth birthday, the Virtual China archives have been added to 88 Bar, which makes us one of the longest-running, English-language China tech blogs today. Check it out: the Virtual China Archives.